Tottenham midfielder Dele Alli "gets bored" if he is not under pressure, says boss Mauricio Pochettino. The England international praised Pochettino for being a tactically "amazing manager" after scoring in Saturday's 3-1 win over Chelsea. 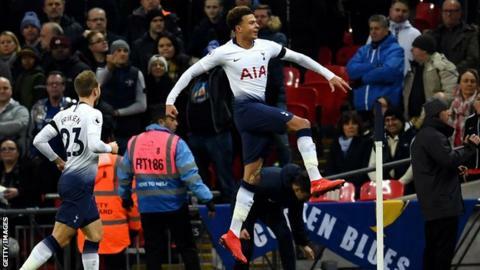 It was the 22-year-old's third goal of the season for Spurs, who host Inter Milan in the Champions League on Wednesday (20:00 GMT). "When he is under pressure he is unbelievable," said Pochettino. "He loves a challenge. He is a winner. His mentality is that he gets bored quickly when he doesn't feel the pressure."